We worked with Biosis Research to develop Bird and Bat related sections for the EPHC National Wind Farm Development Guidelines. 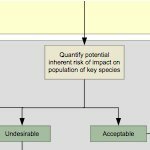 The guidelines use an environmental risk assessment framework to evaluate the risk and assess mitigation options. We specifically provided advice and developed content to give guidance on the risk assessment process, and on specific techniques for quantifying collision risk and population impacts. We also provided guidance on desigining and undertaking post-construction monitoring to measure and manage impacts. This work drew on our experience in risk assessment and monitoring design/analysis for proposed and operating wind farms throughout the development of the industry in Australia. We have provided this assistance to developers, operators and regulators across four states and this gave us the insight required to contribute to the national guidelines.